The Polycom CX5000 HD Unified Conference Station helps you cost-effectively deliver HD voice and video collaboration experiences within a Microsoft Lync environment. 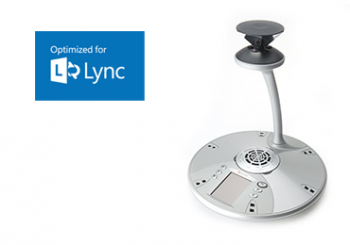 Optimized for use with Microsoft Lync & Skype for Business, the Polycom CX5100 unified conference station brings the powerful collaboration capabilities of Microsoft Lync voice, video and content together through a unique 360-degree panoramic view of the entire room. A second HD video view of the active speaker is also sent at 1080p video resolution using advanced technology that automatically focuses on the current speaker and tracks the flow of conversation to enable richer, more interactive communication. No more reaching for a video control device. It’s a “hands-free” experience that allows you to forget about the technology and simply focus on your meeting. The Polycom® CX5100 Unified Conference Station adds a unique group voice and video collaboration experience to Microsoft Lync 2010 and Microsoft Lync 2013, and soon to be Skype for Business, giving remote participants a panoramic view of the conference room and video that automatically tracks the flow of conversation for more productive and efficient meetings. The Polycom CX5100 unified conference station features Polycom’s legendary audio, bringing the industry’s best voice quality to your Lync meeting with a dynamic range of 160 Hz to 22,000 Hz. Polycom® HD Voice™ and a microphone range of 20 feet (6 meters) means everyone in the room can be clearly heard, even at the end of the table. Optional extension microphones extend the range even further, if needed. While the CX5100 is a USB-only model, for customers needing standalone SIP VoIP for audio conferences, the Polycom® CX5500 unified conference station adds SIP telephony, eliminating the need to install a separate audio conference station in the room. VideoCentric also have the Polycom RealPresence Infrastructure integrated with Microsoft Lync 2010, 2013 and Office 365 in our lab & interoperability testing suite, so we can fully understand the integration between each platform, the solution features & downfalls & how to fully support each solution deployed, whether on-premise, in the cloud or as a hybrid.